An abscess is an accumulation of pus that can result from an infec tion in any part of the body. An abscess is often surrounded by red, swollen tissue. An abscess is an accumulation or collection of pus * that can result from an infection in any part of the body. An abscess is often surrounded by red, swollen tissue. The pus is made up of a mixture of fluid and several kinds of cells: There are microorganisms that are causing the infection, there are immune-system cells that are fighting the infection, and there are millions of body cells that have died in the struggle. Although pus is not pleasant to look at, its presence means that the body is defending itself against disease-causing microbes * . Some abscesses, like boils, are very common. They form just under the skin and usually go away on their own. Some abscesses can form in the gum near a tooth, and those often require treatment by a dentist. Still other abscesses form deep within the body, especially in the abdominal organs or the chest. These are rarer but can be very serious. They must be treated by a doctor and often require surgery. Abscesses may be caused by many different bacteria, fungi, or protozoans, which are kinds of disease-causing microbes. Abscesses result from infections that are or become localized or confined to one part of the body, as opposed to infections that spread throughout the body. Boils and carbuncles are common among teenagers, but virtually everyone gets them at some time. They are called external abscesses because they form on the surface of the body. They are quite similar to each other. The main difference is that carbuncles have a number of core areas where the pus forms, while boils have a single core at their center. Thus carbuncles may resemble a cluster of interconnected boils. * pus is a thick, creamy fluid, usually yellow or greenish in color, that forms at the site of an infection. * microbes and microorganisms are small organisms that can cause disease and that can usually be seen only under a microscope, They include bacteria, viruses, protozoa, and fungi. * follicles are tiny pits in the skin from which hair grows. External abscesses commonly occur on the back of the neck or on the face. They also frequently form on moist parts of the body, such as the armpit or groin. 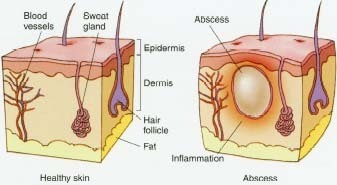 Abscesses in hair follicles * may result in a condition called folliculitis (fo-lik-u-LY-tis). An abscess at the base of an eyelash, which is a special type of follicle, is called a sty. A dental abscess or gumboil is an accumulation of pus in the gums or jaw tissues surrounding a tooth. It is usually formed as a result of infection by bacteria. A common contributing cause is dental decay, which is why regular dental checkups are important. Dental abscesses may also result from injuries such as a fracture in the tooth. If the cause is a dental cavity, the infection begins when the bacteria enter the pulp * portion inside the tooth. At this point, the condition is known as pulpitis (pul-PY-tis). An abscess on the gum is formed as the infection spreads from the pulp of the tooth. Abscesses may form in any organ or cavity of the body. There are many different kinds, and they may be caused by any of a variety of microorganisms. All abscesses occurring in the internal organs require medical attention. In the abdomen, abscesses may result from infections of the gall bladder, liver, kidney, intestine, or pelvic organs in women. They may also be a complication of abdominal surgery. An abscess that forms due to obstruction of the appendix is called appendicitis (a-pen-di-SY-tis), which usually causes severe pain in the lower right part of the abdomen. Doctors usually recommend surgery (appendectomy) to remove the appendix immediately. Otherwise the appendix may burst, causing the infection to spread through the abdominal cavity. In the lungs, abscesses may be a complication of pneumonia. In the throat, peritonsillar (per-i-TON-si-lar) abscess may result from the spread of tonsillitis, infection of the tonsils * . Peritonsillar abscess occurs frequently in young adults. Abscesses may also occur in the brain and in other organs of the body. * pulp is the sensitive area deep inside the central part of the tooth, where the nerves and blood vessels are located. * tonsils are paired clusters of lymph tissues in the throat. They help protect the body from bacteria or viruses that enter through a person's nose or mouth. What Happens When People Get Abscesses? An external abscess is an accumulation of pus that results from bacterial infection. Abscesses that form under the skin may go away on their own. Some require drainage (removal of the pus). group. The bacteria enter the body through the mouth, or through pores in the skin, or through minor cuts and abrasions, such as places where clothing chafes the body. An example of chafing is when a shirt or coat collar rubs the back of the neck. Often, the exact source of the infection is not known. The bacteria that usually cause boils are very common, and having boils does not mean a person is dirty or will spread infection to others. Once the bacteria are under the skin, they are attacked by leukocytes * , which are white blood cells sent by the body's immune system to combat the bacteria. Pus forms as the white blood cells, bacteria, and destroyed cells accumulate, and the body creates a fibrous wall or lining to keep the infection sealed off from surrounding tissues. People who have conditions that may lower the body's immune response, such as diabetes, are more likely to get boils and carbuncles. A person first notices a boil when it becomes a red, sore lump. As the pus builds up inside, the boil begins to swell. It also becomes more painful due to the increasing pressure on the nerve endings in the surrounding areas of the skin and to the inflammatory substances created by the body's response to the infection. Boils on the nose or ear are usually more painful than others. The pressure on the nerves is greater because the skin is tighter in these areas and cannot stretch as much. Usually, a yellowish head, or point, forms on the boil as the pus forces its way toward the surface. Sometimes, however, the boil may subside and disappear on its own, if the immune system is able to overcome the infection early enough. If the boil does form a head, pressure may cause it to rupture, spilling the pus to the outside. Carbuncle infections, which have several closely adjoining points, usually are more severe than boils. They may be accompanied by headache, loss of appetite, chills, and fever. These signs and symptoms are easy to recognize, but if swelling is accompanied by fever, significant pain, or any unusual symptoms, then a visit to the doctor is advisable. Many simple abscesses are treated at home with warm moist compresses that help bring the infection to the skin surface so it can drain. While boils are draining, they are usually covered with dry, sterile dressings until they are completely healed. Healing may take several days or sometimes weeks. Boils that are large, painful, or widespread should be treated by a doctor. This is particularly important if swelling is accompanied by fever, significant pain, or unusual symptoms, or if an abscess is firm with no tenderness. A doctor may prescribe an antibiotic to help fight the infection, or the doctor may lance the boil, which involves making a puncture or an incision with a sterile needle or a surgical knife to let the pus out. Lancing by a doctor only takes a couple of seconds and often results in remarkable pain relief and faster healing. * leukocytes (LOO-ko-sites) are white blood cells sent by the body's immune system to fight infection. Almost everyone gets a boil at some time in their life. Doctors call boils "furuncles" (FYOO-ryn-kulz). In the Bible (Job 2:7), the prophet Job was afflicted with boils from head to toe to test his faith in God. In a tooth where a dental abscess starts, the first symptom is often a painful twinge when eating hot or cold foods. As the infection spreads from the tooth to the gum, the pain becomes throbbing and continuous. A person with a dental abscess will have trouble chewing because pressing the teeth together can be extremely painful. If the abscess or gumboil bursts, the pain may be somewhat relieved. Sometimes people with dental abscesses also have a fever. Dentists can diagnose dental abscesses by noting their patients' symptoms and by x-ray examination. Redness and swelling also may be directly observed in the gum around the tooth. The dentist might need to perform a root canal * procedure in order to save the tooth. If this treatment cannot stop the infection, the tooth may have to be removed. The dentist also may prescribe antibiotics and warm mouthwashes. All abscesses occurring in the internal organs require medical attention. If possible, the source of the infection must be found and treated. Usually, treatment includes surgical drainage of the abscess and antibiotics. * root canal is a procedure in which a dentist cleans out the pulp of an infected tooth, removes the nerve, and then fills the cavity with a protective substance. Bark, Joseph P. Your Skin: An Owner's Guide. Upper Saddle River, NJ:Prentice Hall, 1995. Turkington, Carol A., and Jeffrey S. Dover. Skin Deep: An A—Z of SkinDisorders, Treatment, and Health. New York: Facts On File, 1998.
there is limiting membrane (fibrous) to prevent infection whether in acute case or chronic case that layer is same or different?